Electrolysis is the process of passing electrical current (direct current) through a solution, or molten ionic compound, to decompose electrolytes. This separates the ions, and elements will be discharged at the electrodes. Inert electrodes should be used, otherwise they will react with the solution/products. Electrolysis can only be done using ionic compounds, as it requires free ions to move. This is why it can only be done if in solution, or liquid (molten) state. 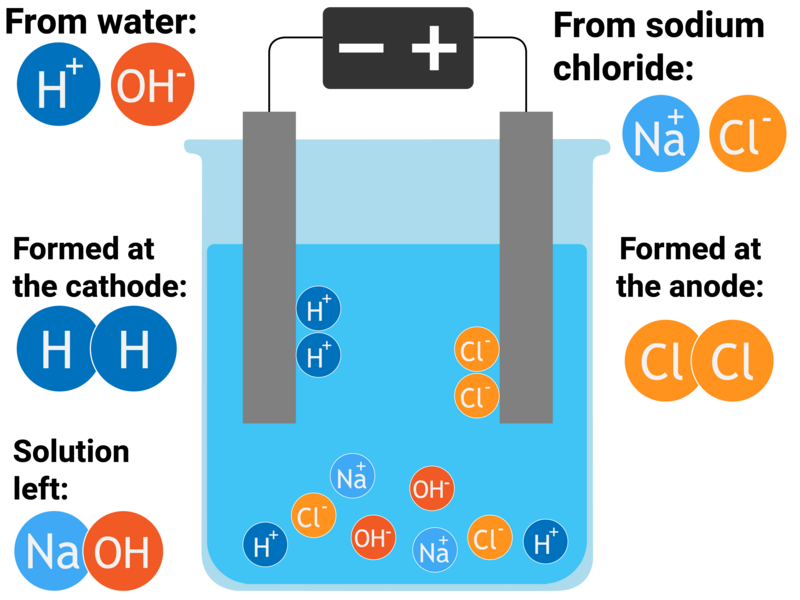 If electrolysis is completed with a solution, then hydrogen (H+) and hydroxide (OH-) ions will also be present, as water will also dissociate. You need to be able to explain the formation of products during specific electrolysis experiments, when inert electrodes are used. In the table below, we can see which products are formed. If you are unsure why the following discharges happen, look again above at the rules of electrolysis. Copper can be purified by electrolysis. Electricity is passed through solutions containing copper compounds, such as copper sulfate. In this process, the anode would be made from impure copper and the cathode made from pure copper. Copper ions are positive (Cu2+), so move to the negative electrode (cathode). 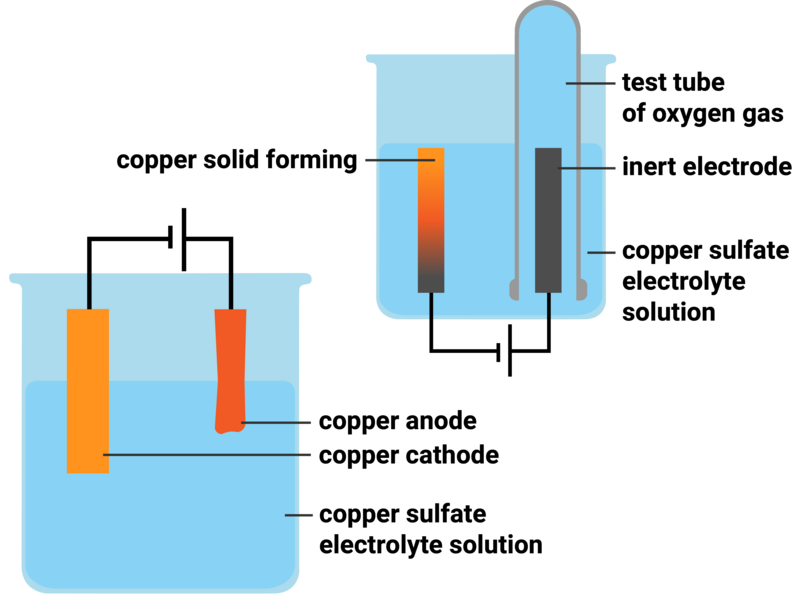 During electrolysis, the anode loses mass as copper dissolves (as the ions are moving to the cathode), and the cathode gains mass as copper is deposited. Using inert electrodes (such as graphite electrodes) will still produce copper deposits at the cathode. However, rather than the anode mass decreasing (like it does in copper purification) we will produce oxygen gas. This can be tested for using a glowing splint, and if it relights - then oxygen is present. Positive ions (cations) will gather at the cathode, and gain electrons. You will either need to write a half equation for a metal, or hydrogen gaining electrons. Negative ions (anions) will gather at the anode, and lose electrons. You will either need to write a half equation for a halide, oxygen, hydroxide or a metal.